Sources: Persian wherever possible, but most of what we know about Cyrus comes from Greeks. Remember that what Persians say might be propaganda, and that Greeks were enemies. 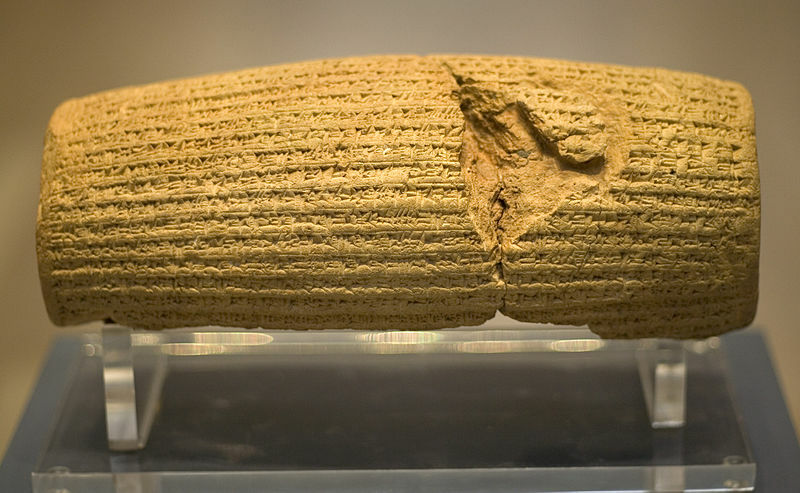 This is part of the inscription on the “Cyrus Cylinder” made of baked clay and written in Akkadian, the language of the Assyrians and Babylonians, not Persian, which Cyrus spoke. Apart from what Cyrus tells us, we actually know nothing at all about his ancestors. The royal family that ruled Persia is often called the Achaemenids, which means the descendants of Achaemenes. Cyrus never mentions Achaemenes: he appears in the inscriptions set up by Darius, as a common ancestor of them both, and the father of Teispes. Astyages [king of the Medes] mustered his army and marched against Cyrus, king of Anshan. The army rebelled against Astyages and took him prisoner. They handed him over to Cyrus. Cyrus marched to Ecbatana, the royal city. The silver, gold and other goods which he carried off, he took back to Anshan. Herodotus adds that the captured Astyages was not punished, but Cyrus kept him with him until his death. The Medes and Persians were henceforth united - Greek historians use "Medes" to mean "Persians" - and the two peoples shared in the administration of the new empire. 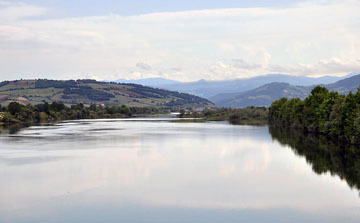 The river Halys had been the frontier between Astyages’ Media, and the territory ruled by Croesus, king of Lydia. [See map.] Croesus was the brother-in-law of Astyages. Croesus’ kingdom was immensely wealthy (people still use the expression “rich as Croesus”). This probably had a lot to do with the invention of coined money (see below). Croesus’ capital was a long way to the west, at Sardis, not far from the Aegean Sea. This was important because when Cyrus got involved in Lydia, the Greeks began to be aware of Persia for the first time. Croesus was very unhappy at Cyrus's activities in Media. He decided to attack him, but, according to Herodotus, first he wanted to be sure that his attack would be successful. To find out the future, you needed to consult an oracle [where men could ask the gods questions about the future]. But which oracle? There were lots. And what if they disagreed with each other? Being boiled in a bronze cauldron, with the flesh of a sheep." Croesus was overjoyed. The Delphic oracle always spoke the truth (he’d checked), and Croesus gave every man in Delphi two gold pieces to reward them: but the mighty empire he destroyed was his own. He crossed the river Halys, invaded Media, and waited for Cyrus, who had to march 1200 miles to face him. But the battle was too close to call, and Croesus returned to Sardis, assuming that was it, until next season (no one went to war in the winter). But Cyrus had two nasty surprises for him. He followed Croesus home with amazing speed; Croesus only just had time to get his army ready to defend Sardis. And then Cyrus unleashed his secret weapon: camels! Their smell made Croesus' horses panic, but most of the army managed to scuttle back into the city. Sardis (left)was supposedly impregnable, and for two weeks Cyrus got nowhere, despite offering a reward to the first man to get over the walls. But then the Persians had a lucky break. A defender's helmet fell off, and came bouncing down over the rocks. Amazingly its owner came after it, collected it, and scrambled back up. His climb had been closely observed, and next day, the Persians attacked using the same route. Thus Cyrus captured Sardis. According to the Greek story, Croesus was condemned to be burned alive, but Apollo took pity and put out the fire. More probably it was a suicide attempt, which Cyrus, not Apollo, interrupted: Cyrus' policy was to show mercy to conquered rulers so they could help him with governing their former kingdoms. Croesus remained as a valued advisor to Cyrus and Cambyses, in all likelihood. But the Ionian Greeks' absorption into the Persian empire was under way - with repercussions that were to take nearly a century to show themselves..
Cyrus was overwhelmed by the lifestyle that Croesus had enjoyed, and no doubt he realised how comparatively little in the way of luxury he had enjoyed so far. In time, the Persians were to become proverbial for their luxurious lifestyle: this was something that only began after the conquest of Lydia. Sardis became Cyrus' western capital - and he took many of its craftsmen (Greeks and Lydians) back to Persia to work on his own new palace at Pasargadae. An important innovation that was borrowed from Lydia was the idea of coinage, which had probably been invented by the Lydians' Greek neighbours around 600 BC. Lydia was quick to seize on the advantages of a money-based economy. Coined money was something entirely new in the ancient world, and was one of the things that helped hold the Persian empire together. The idea of a single currency throughout the world was something developed later by Darius, as we shall see. 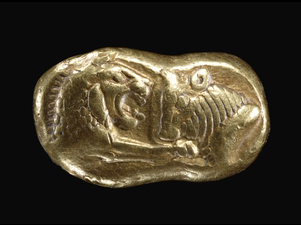 Lydian coin made of electrum (mixture of gold and silver) issued before 600 BC. The design shows a lion about to devour a bull. 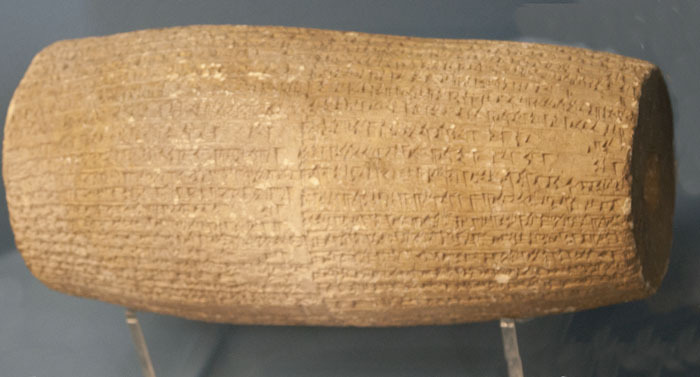 Not the Cyrus Cylinder: Nabonidus,the current ruler of Babylon, which Cyrus was to attack next, left a number of cylinders, of which 5 have been found. The inscriptions commemorate his repairs to temples, and ask the gods to help his son Belshazzar. The founder of the Persian empire was Cyrus, who in a very short time conquered territory stretching from the Mediterranean to the Himalayas. This page deals with his conquest of Media and wealthy Lydia. For his story, we have to rely on the Greek historian Herodotus, and a few references in Babylonian chronicles. The most important document for Cyrus' reign. More details in the next section. These ancient Mesopotamian kingdoms had disappeared over a millennium previously. But Cyrus is imitating the Assyrian and Babylonian rulers who had continued to use these titles. Why not king of Persia? 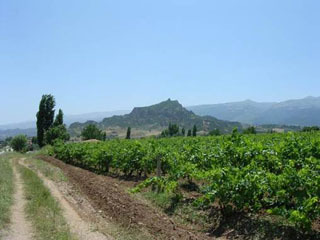 Anshan, in the southern Zagros mountains, was originally one of two Elamite centres. The Elamite rulers called themselves "Kings of Anshan and Susa". The Elamites lost Anshan to the Persian Teispes, Cyrus' ancestor, around 650 BC. More on the Elamites here. But Cyrus' use of the term suggests that he may have intended to show (at any rate in Babylon) that he was the successor of the ancient Elamites, and thus a legitimate ruler in Mesopotamia. Fully discussed here. It's even been suggested that Cyrus was an ethnic Elamite and that the Persian empire was the "Elamite empire" until it was taken over by the Persian Darius. Discussed by D T Potts 2005. 'Cyrus the Great and the kingdom of Anshan.' In V. Sarkhosh Curtis and S. Stewart (eds. ), The Idea of Iran, I. Birth of the Persian Empire. London: 7-28. Does Cyrus now sound quite modest? Greek writers use "Mede" to mean the same as "Persian" - Greeks who were friendly towards Persia were called "medizers" by the Greeks who were not fans of Persia. It used to be assumed that Herodotus' fascinating account of the rise of the Medes was trustworthy. Recently scholars have cast doubt on his narrative - and many believe that there never was a unified "Median empire" of the extent Herodotus decribes. 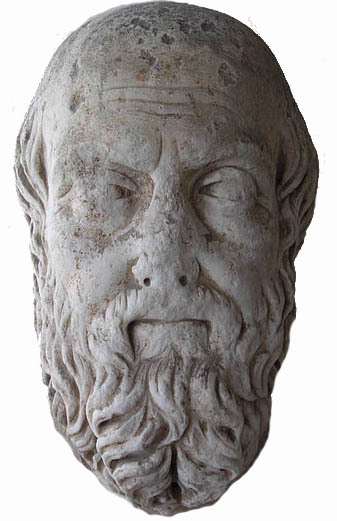 Herodotus was an Ionian Greek who lived from around 484 - 425 BC. Halicarnassus. the city where he was born, was part of the Persian empire - he grew up as a Persian subject. Though Greek, he was fair-minded, and interested in everything he could find out about the Persians, their history and their empire. A later Greek (Plutarch) called him philobarbaros. This was not intended as a compliment. "Herodotus of Halicarnassus publishes here the results of his enquiries, so that human achievements should not fade with the passing of time, neither should great and amazing deeds, some performed by Greeks, some by barbarians, pass into obscurity, and especially the reasons why they made war on each other." His apparently racist use of the term "barbarians" for the Persians still rankles - but most peoples in the ancient world believed themselves superior to foreigners. Herodotus, though, didn't sit in a room researching. He believed he could only find things out by travelling the world, meeting people, and asking them questions. He's often called “the father of history”- but perhaps it's better to think of him as the first reporter, the first investigative journalist. 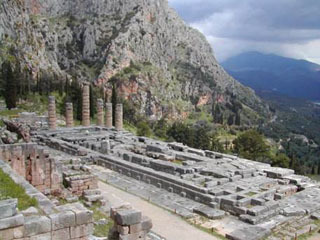 Oracle of Apollo at Delphi in Greece. The Delphic oracle didn't rely on guesswork - or even Apollo! It had a network of informers who would be able to find out what answer was required - but to be on the safe side, the reply was usually - like the one given to Croesus - ambiguous. Even the Persians believed it always told the truth. The date was May 28 585 BC - the date of a solar eclipse foretold by Thales of Miletus. Believed by some to symbolise summer (the lion) overcoming winter (the bull) - the theme of the Now Ruz festival on March 21st. The motif is frequent in Persian art - especially at Persepolis, but its not known what it actually means.